Font that gets your client's postcard noticed. Font selection is as important as all of the other elements in a design, combined. 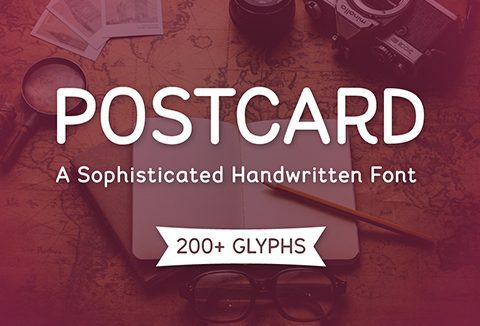 Add Postcard to your font arsenal and get ready for inspiration! Bring emotions and your personality in projects which should keep legibility and elegance. Calm and beautiful handwriting without exaggerated characters or cheesy details. Because of its double (regular/handwritten) nature, the font has proven to be successfully used in wide range of project types. The font is based on author's personal handwriting, so it's absolutely unique. Over 200 glyphs (uppercase, lowercase, numbers & additional characters) cover most Latin based languages. OTF + Webfont. Commercial use + you can also use it on your website or embed it in your app. Desktop font files are delivered in .otf format and work on both Windows and Mac. Webfont will be delivered in .woff and .html format. The font may be used in any personal or commercial projects. Resell, redistribution or modification of the font is prohibited. Contemporary and clean. Versatile. Love it.